When we get involved... We had very early discussions with the core team during the first draft stages of the story. 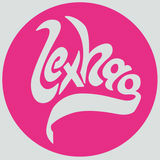 The show had limited resources, time and money, so early meetings helped the team design a product that was achievable. We worked closely with Writer Jack Thorne, Director - Farren Blackburn, Line Producer - Angie Daniell, and Producer - Caro Skinner. It was important that we could comfortably concept ideas and characters. This enabled us to explore new ideas or evolve what we had established in the pilot episode, filmed a year before. Any imagery or material produced during this process served well throughout the show, from executive budgetary meetings, through to production reference and post-production. Final make-up of Polus as he appeared on-camera. The full length image is the final concept that the production worked from. The images below depict the evolution and “look & feel” of the prominent fades. Polus, the skinny looking man, was the first character to be developed. With our previous experience of creating him in the pilot we knew, both creatively and technically, how to develop him for the broadcast show. Working closely with our concept artist, director, producer and writer allowed us to move him to the next level. Concept designs for the lead Fades; Polus and Natalie. We started with quite an emaciated look, which was felt too Zombie like. Instead of adding to the artistes face (prosthetics) or subtracting (CGI) we decoded to work with Ian’s face as it was. The head shot images are based on a photograph we took of Ian during the pilot episode. The progression of the Chrysalis depicts the very early, Alienesque designs, leading to the more humanoid shape. Each image is drawn within the location we used to film the sequence. Many discussions were held about how to achieve this effect. The decision was made to build the complete Chrysalis so we could capture all the action in-camera, on the day. From concept to reality... With “doable” ideas fleshed out and penned into the story, it was time to start planning key shots, sequences and budgets. The tools available to us were: Story Boards, Pre-visualisation (CGI), Workshop tests, Visual effects / Camera tests. Story boards were used in the traditional way, but also allowed the production to cull unnecessary shots. This was very important for the VFX slate, as time and money was limited in post-production. When necessary, we expanded the boards by creating pre-viz animation. This helped, all teams involved, accurately judge what would be needed to accomplish the sequence. We also ran many VFX and SFX tests, proving many of the concepts before they went into a final build. These images depict examples of the core tools we used and some of there results. The light chests were a key, reoccurring effect that we developed from the pilot. These images show the early tests and the rig itself. Each artist wore the chest with accompanying power supply. The chests were fully controllable and remotely operated. Early tests for other key effects. From top to bottom: this image is a CGI particle test, used for growing blossom. Below is one of several variations of Gold Air; an early concept for the angelics, whereby they emit a form of energy from their mouths. The final image is a simple hand glow. We developed this effect by building a small light rig that the artist could were on their wrists. Storyboards were very important. It allowed everyone to visually grasp the big sequences. In some cases it allowed the team to condense and economise the shots to an achievable level. Please click each board image to show the final shot. The wings sequence required considerable design and thought. From left to right: A very sophisticated CGI wing was developed and built over several weeks. The second image is a frame from the pre-viz we created for spatial and design purposes. The final images show an early stage of the animatronic wing rig we built for physical integration. This rig would connect the physical with the digital by moving the bed sheets and knocking over the bedside items. Click the image on page 3 to see the final shot. A shot of the Chrysalis as built by the art department. This was before it had been lit for camera. The second image is the artistes sitting on the set wall waiting for their take. We shot a plate of an empty carpark and a plate of the two guys sitting on the wall. The two compostited together create’s the shot below. The final image is of a portable green screen. Because of the demanding schedule, we captured VFX shots when and where we could. This screen was set-up to capture full length shots of Fades standing around. These were used to populate shots as seen from the top of the carpark. The first two shots depict the Light Vest, before and after the final effect. The light vests did two important things: add light to the artist and set - integrating the final effect AND sped up the post process of applying the effect. Next - Paul's hand glow was achieved with a small custom light rig behind the hand, which was used to drive the visual effect. John’s death sequence used a combination of live action elements that we acquired and CGI elements. These components were warped, match-moved and compostited onto Johns face. Paul in his bed is a before and after shot. Notice the green rig on the right side; used to help the CGI wings interact with the set. The next shot displays the detail of the CGI wing, each feather was modelled and textured. Polus’ makeup went as far as covering his body and head. The addition of a CGI tongue completed the character’ fictional existence. The final shot was a simple, but effective composition. The carpark and the artistes were photographed separately at different locations. 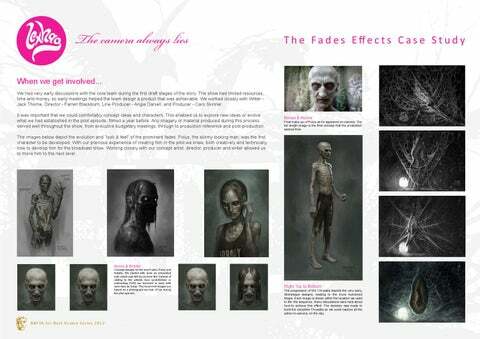 A documnet demonstrationg some of the effects that Lexhag Ltd desgned, made and executed for the BAFTA winning BBC show - The Fades.